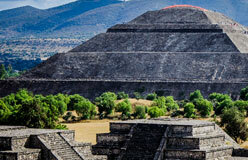 Buried beneath what is now Mexico City, below the corridors and tunnels of the subway system, are the ruins of the greatest city of the Aztec empire, Tenochtitlan (ten-och-tee-TLAN). 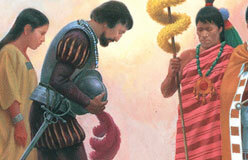 In 1325, after years of searching, the Aztecs chose a site in the middle of Lake Texcoco for their new capital. 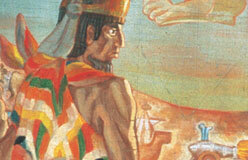 Within two centuries, this island in a swampy, shallow lake had become the center of an empire of over 5 million people. It covered most of central and southern Mexico. 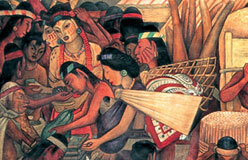 By the early 1500s, Tenochtitlan was one of the world’s largest cities. More people lived there than in London or Paris at that time. How did a mighty empire rise from an island in a lake? What did its people believe? How long did the empire last, and why did it fall? 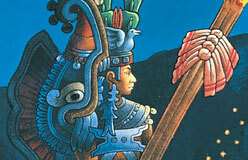 Let’s unlock the mysteries of the Aztecs.